A great deal of media speculation has recently focused on military ties between Burma and North Korea, the two pariah dictatorships of Asia, and particularly on the possibility that Pyongyang may be assisting Burma in building a nuclear deterrent: missile delivery systems and nuclear weapons to mount on top of them. These two states have a history of limited bilateral weapons cooperation. Cooperation was interrupted in 1983, however, by the Rangoon bombing, masterminded by North Korea, which killed a number of top South Korean officials. North Korea’s motivation for the relationship seems to be fairly straightforward: its need to earn hard currency and the relative geographic ease in providing help to Burma. However, recent media focus has highlighted a potentially dangerous development—a North Korea willing to supply nuclear and other technologies to the highest bidder as well as assistance in building underground installations that might be used to hide these weapons, and a Burma seeking to acquire weapons of mass destruction. Based on what we know today, including recent detailed reporting by reliable Burmese defectors, how accurate is all this speculation? One area of suspected cooperation is the building of underground installations, otherwise known as “tunneling.” North Korea has decades of experience building sophisticated underground facilities for military uses. 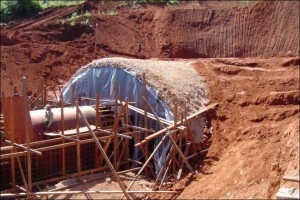 Burmese opposition groups have extensive information on tunneling activities, although based on this information, this activity seems much less extensive than the public speculation. From what we can tell, Burma is building a large command relocation shelter/center for over 1,000 key personnel near the new capital at Nay Pyi Taw. Defector information on this is convincing and the site has been located on satellite imagery. However, other “tunneling” activities in Burma associated with the DPRK seem to be mostly bunkers in a military communications network that are entirely defensive in nature and are no more than prudent precautions to bury important communications nodes and other military hardware. North Korea is adept at such defensive tunneling and, based on defector reports and photographs, has likely been involved in these projects. One possible concern about tunneling assistance is that large hydroelectric projects in Burma could provide cover for covert military installations that would be difficult to identify, for example, by satellite imagery. So far, however, speculation about such projects seems to be just that. There have also been public reports of extensive cooperation between Burma and the DPRK in the area of intermediate range ballistic missile (IRBM) research. The two countries signed a memorandum of understanding (MOU) in November 2008 during a trip to North Korea by a high-level Burmese delegation. This agreement provided for DPRK support to a Burmese IRBM program. Such missiles, normally armed with conventional warheads, would pose a threat to many neighboring states, such as Thailand. They could also carry chemical warheads, although there is no serious reporting suggesting that Burma has a chemical weapons program. First generation nuclear warheads, such as Burma might be expected to develop, would be too bulky and heavy for delivery by these missiles. On nuclear cooperation, there have been a number of defectors who have reported on a Burmese nuclear program. Some vaguely mention the involvement of the DPRK. They state that a few North Korean advisors were present at the Thabeikkyin site north of Mandalay, which is frequently mentioned as a uranium mine and/or uranium ore processing plant. There are also suggestions that Burmese uranium is being mined and sent to China or the DPRK, but these reports are vague and not of sufficient quality to be considered authoritative. One recent defector, Sai Thein Win, actually provides strong evidence that DPRK connections to Burmese activities in both indigenous missile production and nuclear equipment fabrication have been very limited. Win worked in conventional military industries making light weapons and rocket propellants prior to 2001 when he was sent to Moscow for advanced training. In those early years, he knew and worked with North Koreans who were teaching Burmese technicians and engineers the art of producing conventional military hardware such as guns and rockets. He knew their faces, their culture, and their language, and would recognize Koreans again. When Win returned to Burma from Moscow in 2005, his first assignment was to the Directorate of Defense Services Science and Technology Research Center (DDSSTRC), the premier Burmese defense establishment that guides advanced military programs. Located in Pyin Oo Lwin near Mandalay, the center is associated with the Defense Services Technological Academy, the top military university producing officers and engineers for indigenous military production. Win was then assigned to two special modern factories designed and equipped to make classified components for the missile and nuclear programs. These factories have become infamous because they were equipped by German and Swiss companies with modern Computer Numerically Controlled (CNC) machine tools that can be used to make large precision hardware for military or civilian purposes. The Germans broke no laws by supplying this equipment to a “vocational training department,” but were suspicious about its end use and requested annual visits to inspect the two factories to check how the equipment was being used. The Germans have found no evidence of misuse of the equipment, but Sai Win has provided photographs of the factories, the same German equipment, and items fabricated at these facilities that have missile and nuclear applications. Recognizable items in these photos include an impeller for a liquid rocket engine, such as in a SCUD missile. There are also a number of items that can be used in the nuclear industry, such as a fluidized bed reactor for making uranium hexafluoride gas for uranium enrichment, metal reduction vessels, glove boxes, mixers and small furnace tubes. Taken alone these items can each have other uses, but together they indicate that the purpose of this factory is related to a nuclear program. The fact that these objects are not what is being shown on the annual German visits raises suspicions that Burma is not telling the whole truth. As part of my work for an exiled Burmese journalist group, I questioned Win on Burmese-North Korean cooperation. In spite of his work at these two important installations, Win said that the only North Koreans he saw after 2005 were lecturers at the DDSSTRC in classes, such as designing small rocket guidance systems. He clearly and unequivocally stated that he had not seen any signs of Korean personnel or indications of their presence, such as Korean language on engineering drawings or at the special factories. From the perspective of a middle manager in the special weapons program, Korean influence was invisible or non-existent. This well-researched special case suggests no DPRK involvement in the time frame from 2005 to 2010 in any nuclear program. Of course, while Win is a reliable source of information, he is just one person. Beyond individual reports, one has to consider what nuclear assistance might North Korea provide Burma if it was inclined to give aid. It is clear that Pyongyang could provide uranium mining and ore processing advice. It could provide additional advice on the conversion of uranium ore to industrial compounds useful in a nuclear program. It could also provide Burma with centrifuge technology that it received in-turn from the A.Q. Khan network in Pakistan. With indigenous uranium reserves in Burma, a relatively simple technology such as gas centrifuges, and a blueprint for chemistry and mechanical components would be attractive to Burma. But none of the defectors, including Sai Win, suggest DPRK support for anything other than a uranium mine and ore processing plant at the Thabeikkyin site. Alternatively, Burma might pursue building nuclear reactors, a major step towards producing plutonium for weapons. 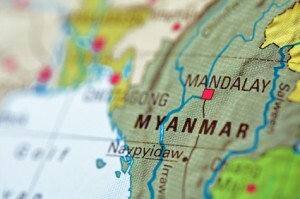 Burma has been interested in modern technologies for reactor fuel and cooling. There is public information that Burma has been negotiating with Russia for ten years to buy a small nuclear research reactor. No deal has been consummated. Such a reactor, however, would be of little value in producing plutonium, although it might serve as a platform for training Burmese nuclear personnel. The DPRK has obsolete reactor technology that it was apparently willing to sell to Syria, and therefore could also offer to Burma. The sale to Syria was only discovered years after the event. No such deal for a reactor from Pyongyang to Burma has yet been uncovered. The absence of evidence does not prove that there is no reactor deal, but given the numerous defector and other reports coming out of Burma, it would seem some reliable information would have leaked out by now. There are some other data points that may suggest suspicious activities. For example, Burma has tried to purchase a few very high-tech items, such as a Japanese magnetic field measuring machine. Export of this machine was a violation of the Japanese Foreign Exchange and Foreign Trade Law. It is considered a “dual-use item” which can be used for the production of weapons of mass destruction, a designation generated by the Missile Technology Control Regime (MTCR) and the Nuclear Suppliers Group (NSG). It could be useful for producing precision magnets used in missile gyroscopes or the special magnets that are used in gas centrifuges, devices for enriching uranium to weapons-grade levels. Japan has released few details of this current court case. It is also possible that Burma is not the end user but was purchasing the machine on behalf of the DPRK. Indeed, this could explain many conundrums about Burma’s high-tech activities. It could be a purchasing cut-out for the North or even an “off-shore” production site for some activities that the DPRK wishes to hide from prying eyes. Such assistance on the part of Burma would be a violation of UN Security Council Resolution 1718, which imposes international sanctions on North Korea. In my experience of over 30 years of examining and inspecting nuclear programs, the simplest explanation for events has often been the correct one. We know that the Ministry of Science and Technology (MOST) specified the equipment and built the special factories associated with the Burmese nuclear and missile program. MOST has been attempting to buy the Russian reactor for years, a reactor that will not enable it to build nuclear weapons. MOST has also selected Laser Isotope Separation to make weapons grade uranium, a technology that has eluded all the major nuclear states for the past 35 or so years, instead of centrifuges that are the choice of almost all proliferators! As an academic organization without military and industrial know-how, it appears they have made very poor choices of machinery for a simple nuclear program and probably did not seek outside help, such as from the DPRK. One plausible explanation is that the Minister of Science and Technology and his subordinates have built a dysfunctional “nuclear program” to please the top leaders who have identified a need for such weapons. In fact, help from the DPRK could actually be a negative in this case, since Pyongyang, which improvised its own nuclear program, would quickly point out the shortcomings. In short, continued control of these programs by MOST is almost certainly a prescription for failure. If, however, the Burmese military nudges MOST aside, there could be big changes. Based on extensive work on this issue, I believe Burma-North Korea cooperation in the nuclear field remains a hypothesis not an established fact. Cooperation between the two in conventional arms production has been widely reported by reliable researchers for years. There is some evidence to suggest Burmese interest in ballistic missiles, but none to suggest they have mastered the production of all the components for such weapons or that they have acquired them from North Korea. There are a few reports from defectors of DPRK nuclear technicians in Burma that consist of very vague associations of DPRK personnel and Burmese entities. In theory, the DPRK could provide Burma with truly unique expertise in uranium mining, ore processing, and advanced materials processing technologies, or even a plutonium production reactor. Assistance with a uranium enrichment program would also be possible given the recent discovery of advanced centrifuge technology in the DPRK. But there is no evidence that the North has passed along any expertise in any nuclear area. A Burmese nuclear program in general, whether for weapons or for other activities, while still only conjecture, is a cause for concern given regular defector reporting.